Pitching for a "formidable front" against the Bharatiya Janata Party, former prime minister and Janata Dal-Secular supremo H D Deve Gowda has said he is not averse to projecting Trinamoll Congress chief and West Bengal Chief Minister Mamata Banerjee as the Opposition's prime ministerial face for the 2019 Lok Sabha polls. The remark by Gowda, 85, comes against the backdrop of reports that the Congress and other opposition parties favour leaving the issue of a prime ministerial candidate for the post-election phase as they feel that opposition unity could be hurt if the subject is taken up ahead of the polls. The remark also comes days after top Congress sources indicated that the party will not mind a nominee for the top post from any Opposition alliance which does not have the backing of the Bharatiya Janata Party and the Rashtriya Swayamsevak Sangh. Gowda, whose party has formed a coalition government in Karnataka with the support of the Congress, said the Congress will play a crucial role in forging opposition unity in the bid by the alliance to dislodge the BJP from power. 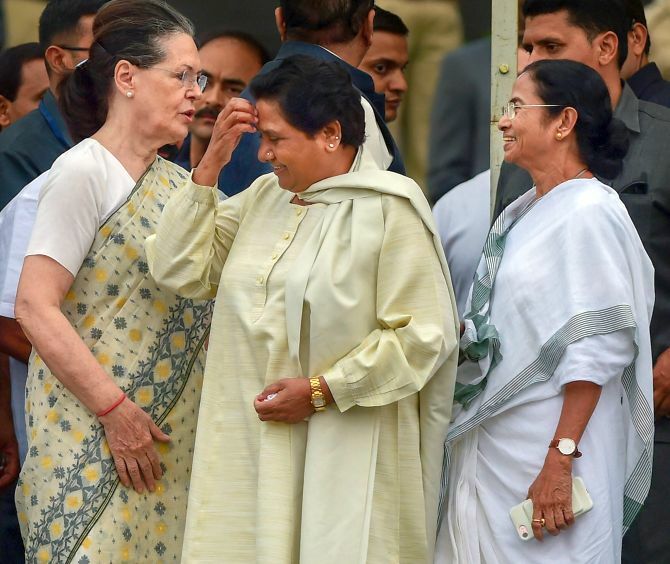 In an interview to PTI in Delhi over the weekend, the former prime minister noted while the formation of a third front is still in the "early stage", Banerjee is "trying her best" to bring all the non-BJP parties together. Gowda headed the Janata Dal-led United Front coalition government in 1996 but his tenure did not last more than a year. Banerjee is pursuing the task of the formation of a federal front seriously after the draft National Register of Citizens in Assam that excluded 40 lakh people from the list in the eastern state, he said. Banerjee is a bitter critic of the NRC and has pilloried the BJP over the citizenship issue. She is also seeking the support of other opposition parties to take on the ruling party. The BJP has stoutly defended the Supreme Court-mandated exercise, saying it concerned national security and safety of the country's citizens.